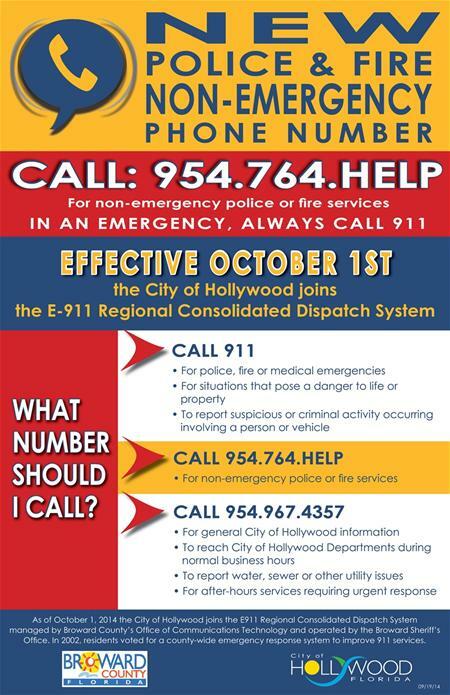 The City of Hollywood has a new phone number for all non-emergency police or fire needs. As of October 1, 2014, residents who want to speak with someone from the police or fire departments on a non-emergency basis should call 954 764 HELP (4357). This number would be for noise complaints or concerns about suspicious activities. For emergencies, always call 911. People should call Hollywood’s general help line at 954-967-4357 for general City information and inquiries. Callers will receive a menu of City departments. After-hours, callers will be able to leave a message or can be routed to a call-taker if their concern requires and urgent response such as a water break. This new phone number is part of a regional consolidated dispatch system. Hollywood is the final city to join the unified operation, most other Broward cities have unified 911 operations with Broward County. In 2002, residents of Broward County voted for a countywide emergency response system to address a fragmented system of emergency call processing and dispatching. With the increasing use of cell phones, a regional 911 system will eliminate inefficiencies, reduce costs and result in better emergency response because calls will not have to be transferred to numerous dispatch centers. Funding for the consolidation of 911 dispatch systems throughout Broward County was approved by the County Commission in 2013, according to Joann Hussey, spokesperson for the City of Hollywood.